Almost everywhere we go we’re reminded that we need to eat better. We can’t take a trip to the grocery store, read the paper, or browse the Internet without being reminded that we’re getting fatter and less healthy, and how we need to change our diet habits. Along with this obvious information, we’re also given a smorgasbord of options that all promise to turn the tide on the obesity epidemic. Some of these are reasonable, but most are marketing gimmicks that are often expensive, rarely effective, and sometimes border on the bizarre. Below, we offer five simple, traditional, money-saving, and effective ways to take control of your diet, and make it a healthy diet. 1. Eat slow. As more and more daily activities get heaped on our plates, we tend to get bogged down and do everything in a rush. Learning to eat slower will help make each meal an experience. And the more that eating is an experience, the higher the likelihood that you’ll want to make it pleasant. One of the effects of eating slower is that you’ll tend to make better food choices. Furthermore, the slower you eat, the better chance you’ll have of not overeating. Your body registers when it’s full fairly quickly, but we’ve become a society of speed eaters who inhale far too many calories—before our natural responses even have time to take effect. Eating just a bit slower can be enough to allow your brain to feed you healthy signals. Also, chewing your food thoroughly has two additional benefits. For one, you’ll taste your food better. Therefore, if you’re making better food choices, it will heighten the pleasure of the meal. It also aids your digestion process. Well-chewed food puts less stress on your body to break it down and, hence, you’ll feel more energized following your meal. How slow is “slow”? A study done at the University of Rhode Island showed that those who chewed their food thoroughly ate less in 29 minutes than those who chewed their food slowly ate in 9 minutes. So you can still slow down and have plenty of time to enjoy your lunch hour. 2. Drink less during meals. Most of us are aware that we don’t drink enough water (more on this later), but meals are not the place to catch up. Liquid dilutes your stomach acids, which can counteract some of the work you’ve done following step one. Furthermore, “washing down” your food is exactly the opposite of what you want to be doing with your calories. The less you drink while eating, the more effective your meal will be. How we became a society that quaffs large quantities of liquid while eating is a bit of a mystery. No other animals do it naturally, so it’s most likely an effect of advertising. Not much can be worse for you than combining “hamburger, fries, and a Coke,” which some ads offer up as the pinnacle of a manly meal. Water alone, which is healthy, dilutes your stomach acids and should be limited, but coupling your meal with soda—even diet soda—is just plain awful. Not only does soda contain calories, it also contains phosphates and acids that change your stomach’s ability to digest the food you’re eating. Not to mention that they are all overly sweet, which interferes with your ability to savor the flavor of natural foods and negatively impacts your enjoyment of the meal. There’s probably a lot more rationale behind the fact that wine has been the meal accoutrement in most cultures. It tends to enhance the flavor of foods but, more importantly, it’s generally consumed in small quantities. A four-ounce glass of wine is plenty to “wash down” most any meal, and that’s all the liquid you need. 3. Drink more water (except during meals). As we’ve stated time and time again, plain water is incredibly good for you and most of us don’t drink enough of it. Beginning each day with a large glass of water is one of the best practices to turn into a ritual. This step alone both helps hydrate you for the day and can instill a habitual response for wanting to drink more water as you become dehydrated. Staying hydrated affects almost every aspect of your life. It makes you less hungry, so it’s one of the best weight loss tricks you can do. You cause less cellular damage, so you’ll function better on almost every level. You’ll be more energized, think better, work out more effectively, and recover from workouts and stress quicker, and your skin will stay supple and young-looking. 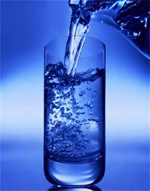 How much water you need varies, but most of us should drink six to eight or so eight-ounce glasses of it a day. This is, of course, highly variable, which is based on temperature, activity level, and the rest of your diet. A diet that is filled with natural foods that contain water—like fruits and veggies—will require that you drink less water, whereas the standard American “junk” diet of fast “convenient” foods, sugar, and fatty meats will require that you drink more. Do keep in mind that, while unlikely, you can drink too much plain water. This is mainly a concern if you’re exercising a lot. Plain water dilutes your body salts—electrolytes—and excessive diluted amounts can cause a condition called hyponatremia. However, most of us consume far too much salt in our diets, making this diluting effect a positive one. For a normal person, hyponatremia isn’t a concern unless you’re drinking in excess of a gallon of water per day. 4. Eat more fruit. Most of us don’t eat enough fruit. Fruits offer us not only an abundance of fiber, water, vitamins, and minerals but also bioflavonoids, which protect our blood vessels, as well as provide well-documented antioxidant benefits. Fruit has gotten a bit of a bad rap lately because of its “high” sugar content, but even people with diabetes may eat three to five servings of fruit a day. The sugar contents of plain sugar, honey, candy, sweets, sodas, etc., are basically empty calories. Replacing your standard sweets with fruit is probably the best dietary swap you can make. Fruit’s sugar content is often exaggerated. For example, let’s look at the sugar content of some raw fruits. Furthermore, natural raw fruit fructose sugar is sparse, not dense, making its calorie impact limited. It is metabolized through the liver, and there, it is generally converted into liver glycogen stores. Since raw fruits offer fiber, fluids, vitamins, and minerals that start on the acidic side but degenerate within digestive straits toward alkaline-ash metabolites, they are regarded as the healthiest appetite-suppressing whole-food snacks you can choose. 5. Change your focus. Instead of focusing on the junky foods you shouldn’t eat, try focusing on the foods you should eat. The easiest way to do this is to focus on what these foods can do for you and how they will make you feel. This can take a little practice because our natural tendency is to let our mind slide into “craving” mode. But by learning to crave performance from your body, your mind will naturally begin to crave foods that make this happen. The easiest way to begin this change is by focusing on how your workout feels when you’ve eaten well and how it feels when you’ve eaten poorly… can you “Get Insane” with Shaun T or “Get on FIRE” with Chalene Johnson without getting exhausted? At no time will your mindset desire to create good habits than when being put under the duress of exercise. This is the time to reference those chili-cheese fries you had at lunch or the cake you ate at a coworker’s going-away party. Nothing creates cravings for plain whole foods like referencing how your body is feeling during the 45th minute of P90X® Plyo. 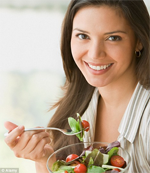 Extremely-Fit: So there you have it, 5 tips to a healthy diet! Don’t forget to visit us on Facebook, and Subscribe to our newsletter. If you really want to help us out, click LIKE below. 🙂 Have a great day! PreviousDo Energy Bars and Protein Bars Fit Your Diet Plan?